After a morning welcome briefing, participate in a tai chi lesson at the Temple of Heaven, one of the iconic sites of Beijing and a classic example of Ming architecture. After lunch, explore Tiananmen Square, and then walk in the footsteps of emperors in the Forbidden City, seat of imperial power for centuries. This evening, enjoy a welcome dinner with your fellow guests. Travel to the well-preserved Mutianyu section of the Great Wall of China. Walk or ride a cable car to the top and view the countryside. Return to Beijing this afternoon, where you Ride Like a Local on a pedicab through a hutong — a neighborhood of small winding alleyways. Today, view the incomparable Terra Cotta Warriors, lost to the world for two millennia until accidentally discovered by a farmer in 1974. Explore them with an on-site archaeologist at your side. Then, enjoy a private Chef’s Table experience in dumpling-making. Later, enter the Ancient Gate of Xian’s City Wall and cycle or stroll along its ramparts. Fly to Chengdu. Visit the People’s Park, the city’s largest public park, where you immerse yourself in local life and culture, watching area residents play traditional Chinese instruments, practice calligraphy and engage in tai chi. Enjoy a tea demonstration at a local teahouse. This evening, savor local Sichuan specialties at a traditional hot pot dinner. Visit the Chengdu Panda Breeding and Research Center and observe giant pandas roaming in their natural habitat. Then, enjoy an afternoon at leisure to relax or explore Chengdu, a city renowned for its thriving music scene and nightlife. Visit the vibrant Ani Tsankhung Nunnery and experience the spiritual heart of Tibet at the sacred Jokhang, a 1,300-year old temple. Wander Lhasa’s Barkhor Bazaar, and visit the Dropenling Tibet Handicraft Development Center. Continue to renowned Sera Monastery to witness lively “monk debates.” Then, discover the Dalai Lama’s former summer residence at Norbulingka, surrounded by trees, ponds, gardens and pavilions. Visit Sanggye Dhunghor, where some 200 statues are carved into a dramatic rock face. 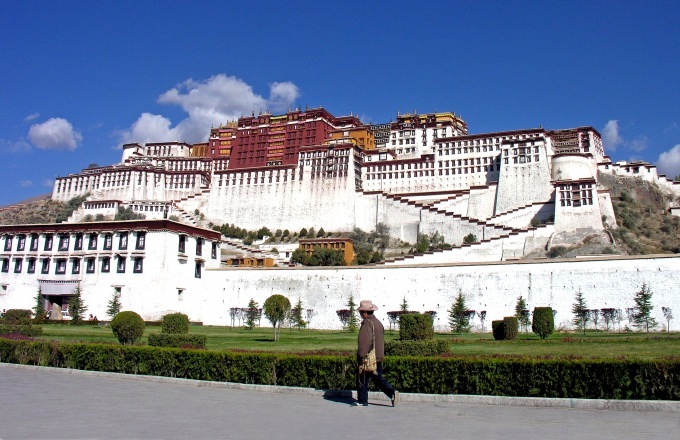 Next, venture beyond the towering walls of the awe-inspiring Potala Palace, former winter residence of the Dalai Lama. Fly to Chongqing to board your river cruiser for a three-night journey through the Three Gorges region. Tonight, view a documentary on the Three Gorges Dam Project. Disembark for a shore excursion to Fengdu where you visit a village relocated by construction of the Three Gorges Dam. Meet a local family, visit a kindergarten and take in a kaleidoscope of sights at a farmers market. This evening, attend the Captain’s Reception. Early this morning, ‘Yangzi Explorer’ navigates the Qutang and Wu Gorges before anchoring at Badong, where you board a ferry and travel up the Shennong Stream. Disembark to board local “pea pod” boats poled by Tujia boatmen and view the scenic Bamboo Gorge. The Tujia are members of a local minority culture famed for their boat-building skills and keen knowledge of the Yangtze. Tonight, gather for a “Taste of China” Dinner experience. Explore the Three Gorges Dam Site and Exhibition Center this morning. Then, disembark and fly to Shanghai. On arrival this evening, transfer to your elegant hotel, on the city’s historic Bund. Explore Shanghai, visiting Zhujiajiao, a water village evoking China’s medieval past. Cruise its main canal in a sampan (wooden boat). Enjoy a Scenic Sundowner at the House of Roosevelt, taking in skyline views of Shanghai. Then, attend a Shanghai Acrobatic show. Extend Your Journey | Enhance your journey with a pre-tour extension to Mongolia (5 days from $3,995) and a post-tour extension to Guilin & Hong Kong (4 days from $1,995). Fly to the vast Gobi Desert, visit scenic mountain gorges lined with glaciers, and enjoy a welcome dinner. Return to Ulaanbaatar. Tour Gandan Monastery and visit Zanabazar Fine Art Museum and Sukhbaatar Square. Fly from Shanghai to Guilin and transfer to your hotel. Visit Reed Flute Cave, Fubo Hill and Elephant Trunk Hill. Enjoy bamboo rafting from Yangdi to Xingping, transfer to Yangshuo, ride a bicycle or golf cart in the country. Fly to Hong Kong. Depart for Sheung Wan, visit a local herbal medicine market and Man Mo Temple. Ride a sampan to a floating village in Aberdeen. Tonight, enjoy a farewell dinner with fellow guests. 5 Things That Will Surprise You in China | From Beijing to Shanghai, ancient and modern still collide in five magical places. Suite Upgrade Package | Upgrade to suites at all hotels throughout your journey from $1,765. Take This Journey Private | This itinerary is also available as an independent journey, Signature China, Tibet & the Yangtze, with A&K local guides.